With so much focus on turkey and ham at Christmas, it’s easy to forget about the vegetarians and vegans among us. 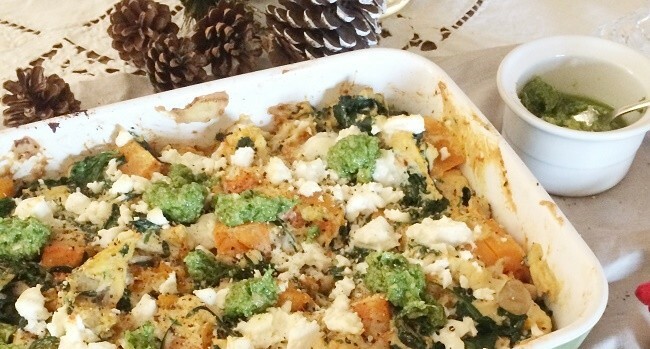 Whether you are vegetarian yourself or cooking for a vegetarian, there are plenty of ways to bring vegetable cheer to the dinner table this Christmas. In fact, many of the best holiday recipes just happen to be vegetarian; think maple roasted brussel sprouts, mashed potatoes and honey glazed carrots. Vegetarian dishes are often enjoyed as much by the meat eaters as they are by the actual vegetarians. To help you out this Christmas, we’ve designed a vegetarian Christmas dinner that can easily be adapted for any vegan guests. The starter can be enjoyed by the entire family and the main course can be served along with the usual veggie sides such as sprouts, red cabbage and roast. It seems obvious, but don’t forget to keep your sides vegetarian; resist the temptation to add bacon to your sprouts and to cook your roast potatoes in duck fat. 1.Bring vegetable stock to a boil in a large saucepan. Add the barley and a pinch of salt. Cover, reduce heat to low and simmer for 45 minutes until the barley is soft, but not mushy. Drain any excess liquid from the barley and set to one side. 2. In a small bowl, combine the olive oil and honey and season with sea salt and black pepper. Preheat the oven to Gas 6/200C. Prepare the vegetables as per the ingredient list. 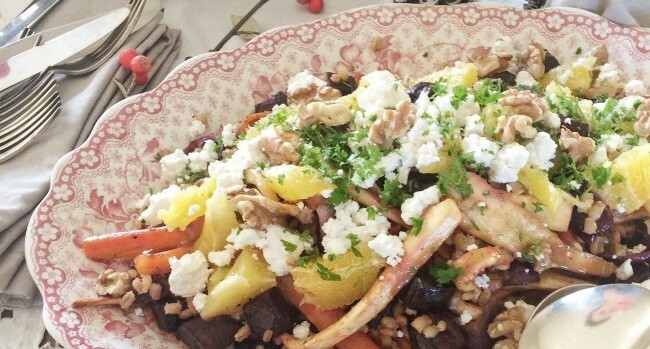 Combine the carrots, parsnips and onion on one baking sheet and the beets on another. Coat the vegetables with the olive oil and honey mix. Roast the carrots, parsnips and onions for 30 minutes and the beets for 40 minutes, turning occasionally. 3. Add all the dressing ingredients to a jar and close the lid tightly. Shake vigourously to combine. 4. In a large serving bowl, combine the pearly barley, roasted vegetables and the dressing and toss lightly. Top with the crumbled goats cheese, orange segments and parsley and serve warm. Adapt to Vegan: For a vegan version of this starter, leave out the goats cheese. 1. Preheat the oven to 200C/Gas 6. Half the squash lengthways and remove the seeds. Place the squash halves, flesh side up on a roasting tray. Pierce the flesh with a knife. Drizzle with olive oil and red chilli flakes and brush to coat the flesh of the squash. Roast for about an hour until soft. 2. Heat a tablespoon of olive oil in a large frying pan over a medium heat. Add the mushrooms and cook for 4 minutes. Add half the spinach and a pinch of sea salt and cooking for about three minutes until the spinach is wilted. Add the remaining spinach and another pinch of sea salt and continue to cook for another three minutes until all the spinach is wilted. Grate the nutmeg on top. Remove from the heat and set to one side. 3. To make the tofu ‘ricotta’ add the sunflower seeds to a food processor and blitz until ground. Add the tofu, olive oil, lemon juice, salt, garlic, basil and nutritional yeast and blitz until smooth. 4. To assemble the bake scoop out the flesh of the butternut squash and roughly chop into bite size pieces. Place in a large baking dish. Add the tofu ‘ricotta’ and the mushroom and spinach mix and toss to combine. Season well with sea salt and black pepper.Sprinkle crumbled feta cheese on top and bake in the oven for 20-25 minutes until golden. 5. While the bake is in the oven, make the spinach pesto. Place all the ingredients save for the oil in a food processor or blender and pulse until broken down into a course consistency. Add the oil and pulse until combined. Ideally the pesto should be course as opposed to smooth. 6. To serve, spoon the bake onto plates and drizzle the pesto on top. Adapt to Vegan: For a vegan version of this main course, leave out the feta cheese. 1. Pour the drained liquid from the can of chickpeas into a mixing bowl and add the lemon juice. Whisk into soft peaks. 2. Melt the chocolate in a heatproof bowl over a saucepan ¼ full with simmering water. Add the orange juice and sea salt once the chocolate has melted and stir to combine. 3. Gradually fold the aquafaba into the melted chocolate in three separate batches until fully incorporated. Try to do this in as little folds as possible. 4. Transfer to individual serving glasses and place in the fridge for an hour to allow to set. 5. To make the ginger crumb, preheat the oven to 180C/Gas 4. Mix together the ground almonds, ground ginger, sea salt and orange zest. Melt the butter and add it along with the maple syrup to the dry ingredients. Spread over a baking sheet lined with parchment paper and bake for 20 minutes, until golden. Allow to cool. 6. 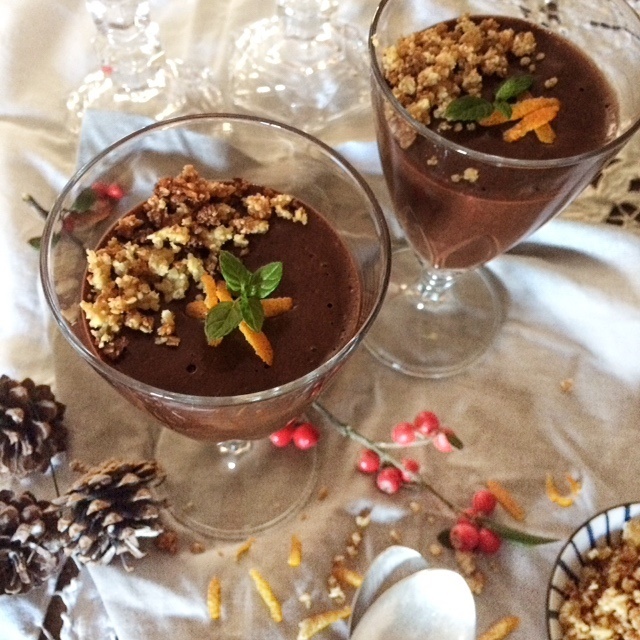 To serve, sprinkle the ginger crumb on top of the chocolate mousse, grate a little orange zest on top and add a sprig of fresh mint. 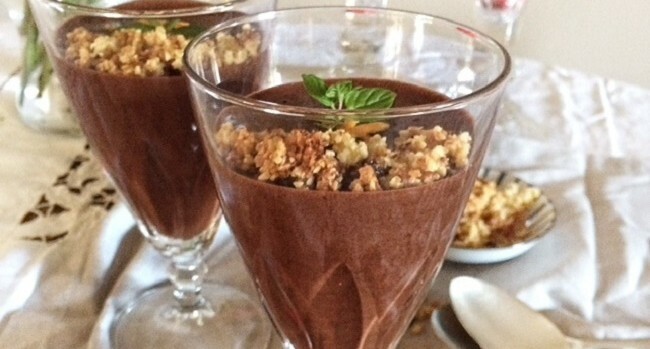 Adapt to Vegan: For a vegan version of this dessert, use 30g of coconut oil instead of 50g of butter in the ginger crumb. 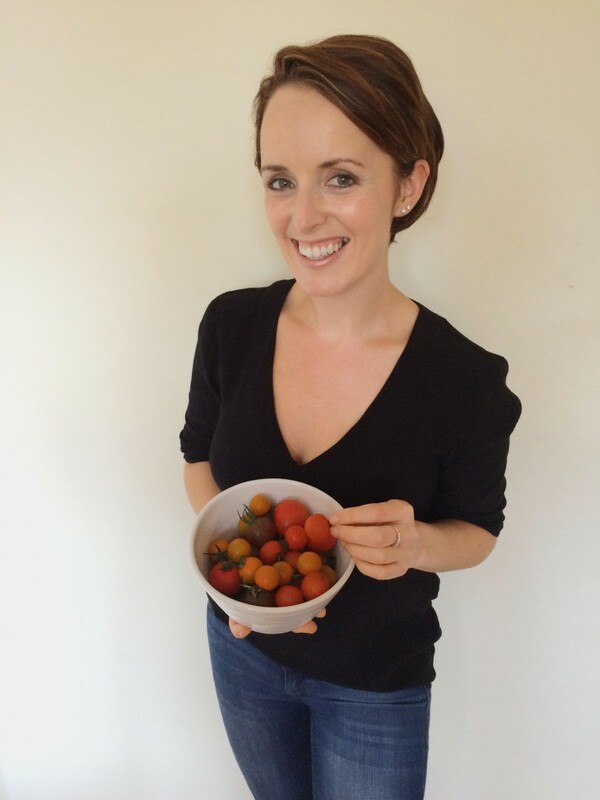 Frances Walsh is the creator and writer behind healthy lifestyle blog, The Honest Project. The Honest Project focuses on plant based eating and cooking, using vegetables, fruits and wholefoods. Frances’ interest is in preparing and eating foods that are made from scratch but are practical and easy to make for even the most inexperienced cook. For more information visit thehonestproject.com.